Tamil Nadu Public Service Commission (TNPSC) is going to Release the Answer Key for the Group – II (A) Non Interview Posts Recruitment -2017. TNPSC Group 2A Answer Key Available here. Those who are searching TNPSC Group 2 & 2A Old Questions Papers Download Pdf, can utilize this page. We have provided TNPSC Group 2 & 2A Old Questions Papers Download Pdf here for your reference. Tnpsc Group 2 Exam Going to held on 11.11.2018. Total Vacancies are 1199. உங்களுக்கு MAY, APRIL, MARCH to JULY மாத CURRENT AFFAIRS வேண்டுமா? Surely this will be a good news for the TNPSC Aspirants, Tamil Nadu Public Service Commission (TNPSC) released an official Recruitment – 2017 Notification to Recruit 1953 Posts in Group II (A) Non Interview Posts. The Proper TNPSC Group II (A) Notification is announced on 27th April 2017. It will give an immense pleasure to the aspirants who are preparing for the above recruitment examination because the State Recruitment Commission has increased the number of vacancies from 682 to 1953 Posts. TNPSC has decided to conduct the examination on 6th August 2017 (Sunday). The Examination will be conducted in various exam centers around 32 Districts around Tamil Nadu. Previously the commission had invited the online applications forms from 27th April 2017 to the Last Date of online Application 26th May 2017. TNPSC conducts Recruitment Process for selecting various Posts such as Personal Clerk, Steno Typist, Lower Division Clerk and Assistant Posts. The Distribution of vacancies for Group – II (A) Recruitment are Personal Clerk – 7 Posts, Steno Typist – 6 Posts, Lower Division Clerk – 12 Posts and Assistant – 1928 Posts. The Pay scale for the Group 2A Non Interview Posts including Personal Clerk, Steno-Typist and Assistant posts will be Rs.5,200/- to Rs.20,200/- with the Grade Pay Rs.2,800/- (Nearly Rs.22,000/- Per Month Salary). The Age Limit Prescribed for the above posts for the Applicants (Candidates) other than SCA / SC / ST / BC / BCM / MBC is 30 Years as Maximum Age Limit and NO Maximum Age Limit for SCA / SC / ST / BC / BCM / MBC / Denotified Communities / Destitute Widows of all communities. Then coming to know about the Application Fee it is mandatory for TNPSC Applicants should have registered for One Time Registration (OTR). Fee for that One Time Registration Rs.150/- and the Exam Application Fee is Rs.100/-. TNPSC has revised an important note regarding One Time Registration (OTR), that is Applicants who are already registered in OTR paying Rs.50/- before 1st March of 2017 and those who have registered for OTR on or after 01.03.2017 by paying Rs.150/- are exempted from paying the registration fee for the above recruitment. TNPSC Group 2A Non Interview Posts Recruitment – 2017 Official Answer Key will be Downloaded at official website of Tamil Nadu Public Service Commission (TNPSC) www.tnpsc.gov.in. The official Answer Key 2017 can be easily downloaded by logging on the above mentioned commission’s official website and Selecting ‘TNPSC Group 2A Non Interview Posts Recruitment 2017’ Link and choosing Answer Keys option. Today Group 2 Exam Question Paper and Group 2 Answer Key Updated here. Keep visit this page for different Academy Answer Keys. Name of the Post: Personal Clerk, Steno Typist, Lower Division Clerk and Assistant Posts. Number of Vacancies: 1953 Posts. Category: TNPSC Group 2A Answer Key Non Interview Posts Examination. Date of Notification: 27th April 2017. Last for Online Application: 26th May 2017. Date of Written Examination: 6th August 2017. Age Limit: Maximum 30 Years for Notified Communities and NO Age Limit for others. Educational Qualification: Minimum Under Graduation from a recognized institution or University. 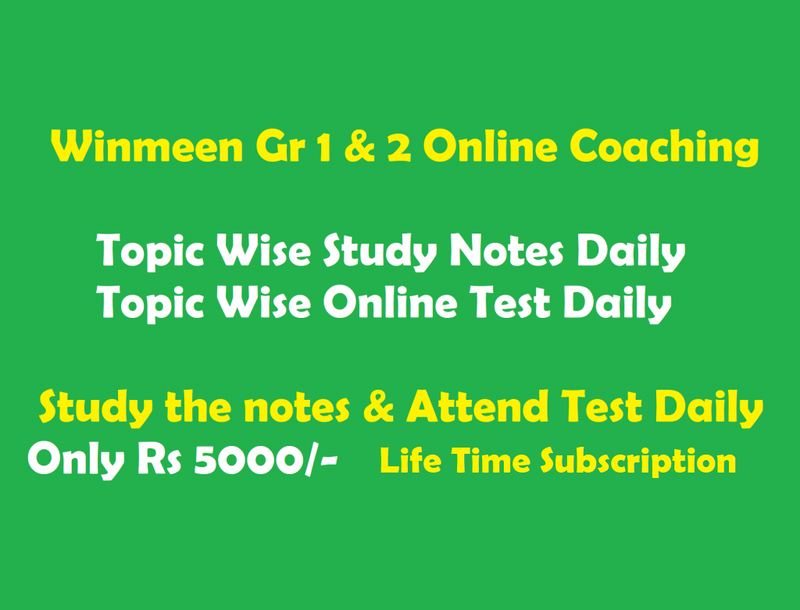 Pay Scale: Rs.5,200/- to Rs.20,200/- with the Grade Pay Rs.2,800/-. Log on to the official website of the Tamil Nadu Public Service Commission (TNPSC) www.tnpsc.gov.in. Select the Date of the Examination Conducted i.e. 06.08.2017. Now select the Part which you want to download i.e. GENERAL TAMIL OR GENERAL ENGLISH AND GENERAL KNOWLEDGE – GENERAL STUDIES Answer Keys.